I just put the finishing touches on the 2014-2015 annual portfolio and I thought you might like to take a quick peek at it before I file it away. As I mentioned in the video, I store all of our portfolios upright (with the spine showing) in a clear plastic tub in our basement. At the end of each summer, I also add clear plastic sleeves to each child's section to hold smaller individual projects that he/she has completed throughout the year as well as any ribbons earned from the country fair. Achievement test scores are meant to show a progression. If I stored them in an annual binder, I would have to pull out every single binder each year in order to see all of the test scores at a glance. Instead, I store each child's stack of annual test scores from all previous years in a file folder inside the same tub that holds the annual portfolios. Each child gets his/her own file folder and all the folders are stacked together for easy reference. To be honest, I don't refer to these folders often, usually only once a year after I receive a new set of scores. But, when I WANT to see them, it's nice to know I don't have to haul out seven year's worth of binders. For a few years (back in the days when people actually printed photos), I inserted photo sleeves into the annual portfolio. These photos were a great way to display larger, 3 dimensional projects that would not fit nicely inside a three-ring-binder, AND they made for nice "proof" that we DID, IN FACT attend all those wonderful field trips. Later, I chose to just insert a CD of photos into the binder. But now, I don't do either. 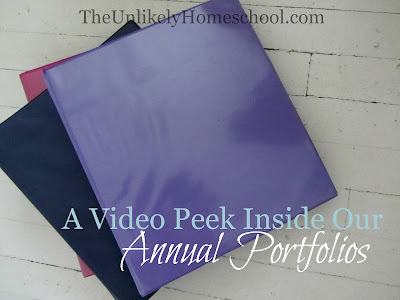 Since so much of our homeschool happenings are chronicled HERE in full color, I no longer include photo documentation. It just takes too much of my precious time. Should the need for photos ever arise, I'll know right where to go to find them. As promised, here are the links that I alluded to in the video. And now it's your turn? Do you make an annual portfolio? How is yours different from mine? What do you include? I will like to know what do you do with the Homeschool Calendar at the end of the year? Every of your post are inspiration for me! I actually keep it, Leslie. Like the portfolio, the calendar also stands as a record of the year. It would actually fit inside the binder, but I put it on a shelf with that year's curriculum so that if and when I use those materials again, I can refer to it. Do you use an online scheduler, attendance tracker, etc, that you input info into and include that in your binder? I am new to homeschooling and was wondering if you use or have used an online scheduler/attendance tracker, and if it helps with record keeping and reporting. Great question, Desiree. No, I do not. I use a pen/paper old school planner that has all of that included. I don't have to keep attendance in my state, so I don't use that section of the planner, but if I ever have to, it's pretty handy. super super helpful!! Thank you so much for taking the time to make and share!